I woke up at 7:00 am and saw that we were getting close to shore – and there were a couple other ships close to shore. Grand Cayman is a “tender” port, so we’ll anchor a ways out and take small tender boats into port. Last time I did this, in January, it looked like a parking lot of boats out here. We’ll see how it looks here later today. People going on excursions go first, then we can get tender tickets. I imagine if we go later in the day we won’t need those, but if we do, they’re in Topsiders on 12, mid. Unfortunately, we’re going to miss that since it’s at 8:30 pm only. Tonight is the night we have dinner with an ship’s officer in the Tsar’s Palace. It might seem rude to say “Gotta Go!” in the middle of the meal. As predicted, after breakfast in the Great Outdoors, tender tickets were no longer needed. We gathered up our stuff to take shopping and waited in line for the next tender. On shore, we avoided “pirates” and other photo ops. 5 other ships in port today – 3 Carnivals, one other Norwegian (Pearl) and a Royal Caribbean. All tendering folks to and from town. We looked in the windows of the terminal stores, then kept walking out the gate to the main road along the harbor in George Town. We looked in a couple jewelry stores and a Swatch store – Tom is still looking for a watch – but found nothing appealing in our price range. We found the “Cariloo” store where everything is bamboo and Tom got another shirt. He had bought one onboard the first sea day. It does feel nice and soft but I didn’t want to get a Tshirt. We ran into the “hot tub vet” and her mom and Tom mentioned Cushing’s again. Maybe we’ll email later. Or not. Up the street to a Scotiabank where Tom enquired about opening a bank account. Their dollar is more stable now than the US. Back down to shopping – into DelSol. I got another hat, this time with a butterfly that adds color when it is out in the sun. A tshirt somewhere else, a bathing suit for Tom, some trinkets. It was very hot and there were just too many people from all these ships so we crossed the street to go back to the ship and came across a small park. The lookout station was in a small treehouse. Back inside the terminal, we got a tote bag to carry all our swag, plus some wind chimes. We had our first lunch onboard when we got back. We took it to the Great Outdoors again. Much nicer than sitting outside than in the Garden Cafe. Walking, reading, writing, napping… tI had thought we might go in the hot tub/pool again but the afternoon disappeared. Time to get ready for our dinner with an officer. Dressed up and hustled down the Photo Gallery on 7, mid. I thought we were going to have our picture(s) taken but it was really just a meeting place. We got to our table in Tsar’s Palace. Two others were already there, another Thomas and a Dr. Julie. We had assigned seating so it was Sandra Franklin, Human Resources person, with a Tom on either side. On my other side were 2 women who had been best friends since second grade, for about 50 years. They talked about once a week but this was their first cruise without their families and their first non-Princess cruise. The more talkative of the 2 was a photographer. Dr. Julie was – oh yes – a veterinarian. She seemed surprised that people got Cushing’s so we had more discussion about that. This will be known as the Educating the Vets cruise. 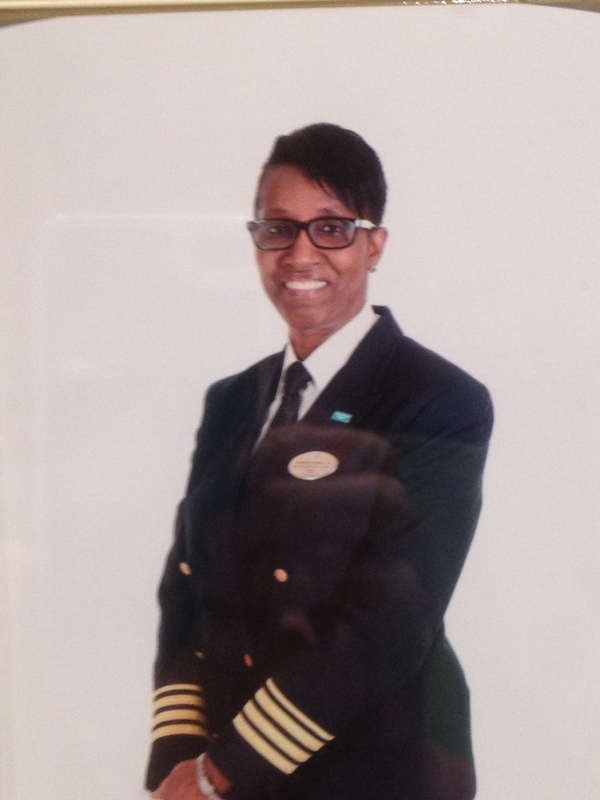 It was an excellent dinner and we learned a lot about ship operations, NCL and more from Sandra. Much of the crew here is from the Philippines but none had lost family members in Typhoon Halyan. NCL offered support to all and made phone calls to check on family. Chocolate Buffet night. People lined up waiting. We went in, got some pictures but it was just too crowded. On our way out, we found the “Sugar-Free Chocolate Buffet” Much fewer stuff by way fewer people. So we got a few “healthy” items and went out to the Great Outdoors to indulge. Maybe no sugar but I think that there was a bit of fat.